This is a beautiful watch with a clean, classic look. 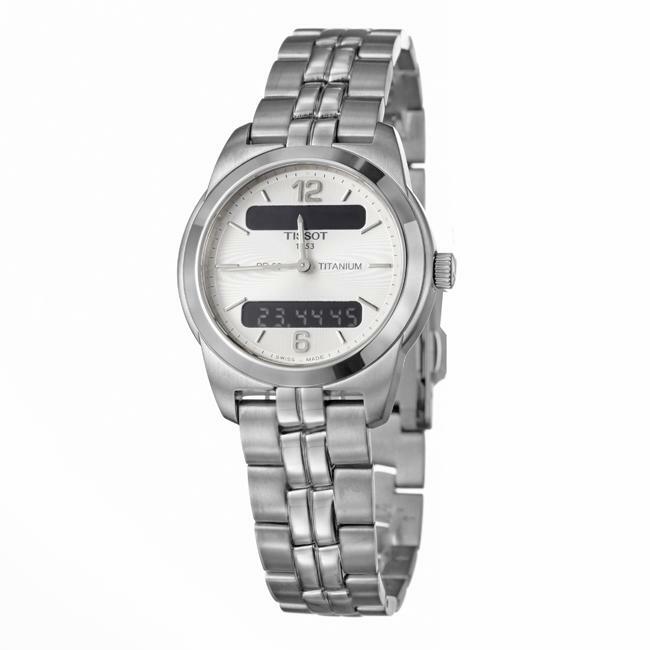 I bought it for my girlfriend as a dress watch because it also has digital functions, which she likes. The watch is very light weight (titanium). It came in a beautiful box with all sorts of extra things (a couple of catalogs and even a small book on the history of Tissot) but NOT instruction manual! I'm sure this must have been lost of left out of my package somehow. We were able to find the instructions online however, it wasn't a huge deal. Overall it's a very nice watch and I highly recommend it. This sleek titanium watch by Tissot is a premium women's watch. The women's T-Classic PR50 digital watch features an analog display with digital chronograph functions for the elegant woman with an active lifestyle. Yes. the instruction is confusing, but doesn't bother me at all. I bought this watch 13 yrs ago, I paid $***. since I lost the watch I don't' wear watch no more. I love this titanium light weight watch. I am going to buy it again. I have to assume that this was a nice watch, because I was not able to find that out. The instructions for setting the watch had been translated from it's mother language to english. The problem with that is that it made it impossible to understand the instructions. Also, you would go on aways reading the instruction s when all of a sudden it would say, "Men's watch only"! Another problem was that these instructions were meant to apply to several watches (I'm not sure how many), so you could never be sure you were reading the correct ones! Sent the watch back after carefully putting all package materials back in box, hopefully I won't be docked for not returning the watch in pristine condition (according to them). Apparently they are very picky about the conditions of the watches that are returned to them, using a grading system to determine the amount of money that will be returned to the customer. Be very careful about ordering foreign watches with digital/analog faces! "Item #: 12786524 Can you tell time in the dark? Does the digital readout have a light? or are the analog hands and dots luminescent? I need to know if I can read it in the dark? Thanks." Hello jysteph, The "Tissot Women's T-Classic PR50 Titanium Digital Silver Dial Watch" has a back light so that the digital clock can be seen in the dark. Thank you for shopping Overstock.com; let us know if you have any additional questions.